Silly question… how would you like some free advertising? 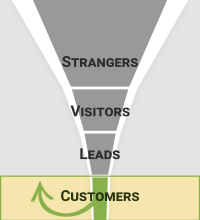 Success stories are best used in the final stage of your marketing funnel, and will help you delight your customers, turning them into repeat buyers and active promoters of your business. According to an intensive study by McKinsey & Company, 60% of consumers of facial skin care products went online to conduct research about a product after they purchased it. Why? They were deciding whether to recommend the products to others. When customers are happy with a purchase, they’ll advocate for it by word of mouth, making it easier for their peers to decide who to buy from. Your mission, should you choose to accept it, is to make it easy for your customers to spread the word about you. Success story videos are easy to make, easy to share, and exciting for everybody. Everybody likes it when “real people” win. People share stories that move them, and if the story is powerful enough, it can help you move your new referrals through your marketing funnel faster. This video does an excellent job of telling the subject’s story, clearly demonstrating what her life was like “before” and “after” her experience of transforming her diet. Note: there are a couple places where I would trim for time. I would also add a call to action at the end. This video is packed with charts, graphs and info that Survey Monkey’s data-hungry niche will eat up all day long. Note: I know. The guy’s a little boring, but … well, he’s genuine! These days, everybody has a camera! If you have good rapport with your customers, they’ll be happy to record a “real video” like this to help you share their stories. Note: I would suggest adding a small amount of polish to a video like this. I can clean up the audio (making it “jump” out of the speakers better) and brighten the video for $149.